Seattle is offering the Czech company supplying the train cars new financial incentives and penalties to finally get the line running by summer. Seattle has revised its contract with a Czech train supplier, in hopes of getting the long-delayed First Hill Streetcar line running this summer. Inekon is building six trains for the new route, and one that Amazon is funding to improve frequency on the existing South Lake Union corridor. When the work began in 2012, the city promised to begin First Hill service by early 2014. The train delivery date was changed to October 2014, but suppliers missed that deadline — even as the tracks and stations on Broadway and South Jackson streets stood ready for action. Now the trains are to be delivered in March and April, and complete final on-street testing in May and June, said Scott Kubly, director of the Seattle Department of Transportation (SDOT). The carrots and sticks in the new contract include Seattle forgiving some $150,000 in late-delivery penalties, while promising stiffer penalties if Inekon lapses in June. The change order was signed Friday in Seattle by Kubly and Josef Husek, president of Inekon Group. Husek flew to Seattle from Europe to sign the document, after an unusual two-day trip to the factory in Ostrava, Czech Republic, last month by Kubly and Paulo Nunes-Ueno,SDOT’s new transit-division director. On the bright side, Inekon trains have a solid reputation for quality, with few if any breakdowns along the South Lake Union line over their first seven years. Friday’s change order shows hope of an improved schedule from what SDOT recently told the City Council, including a staff memo saying Inekon supposedly would need until June to deliver the last train. “I’ve been very concerned and frustrated with this project for some time,” said City Councilmember Tom Rasmussen, chairman of the Transportation Committee. SDOT should have been forthcoming a year ago about the risk of delays, Rasmussen said. Kubly was hired in July, long after the 2012 start of project construction. The First Hill line, funded predominantly by $133 million from Sound Transit and $2.5 million in city money, will connect the future Capitol Hill light-rail station with the existing International District/Chinatown Station and Pioneer Square. It’s part of the “Sound Transit 2” plan for transit expansions and a sales-tax increase that regional voters approved in 2008. The 2.5-mile route also reaches some of the state’s densest neighborhoods, Seattle Central College, Seattle University and several hospitals that ought to provide more than 3,000 daily passengers. Trains are to run 10 to 15 minutes apart, but the slow ride, as trains run in the same lane as general traffic, would average 18 minutes, end to end. A recent quarterly update predicts a $1.6 million cost overrun. • National fire regulations changed, to require more resilient train floors. The first floors broke into flames during a test in Europe, forcing a redesign. • Seattle is the first client to order streetcars that can briefly travel off wire — to avoid conflicts with King County Metro trolley bus wires in Little Saigon. Streetcar detractors, including Rasmussen, say improved electric-bus service would have been a superior alternative for the hills east of downtown. Inekon also suffered an apparent backlog of orders with too few workers, city officials say. 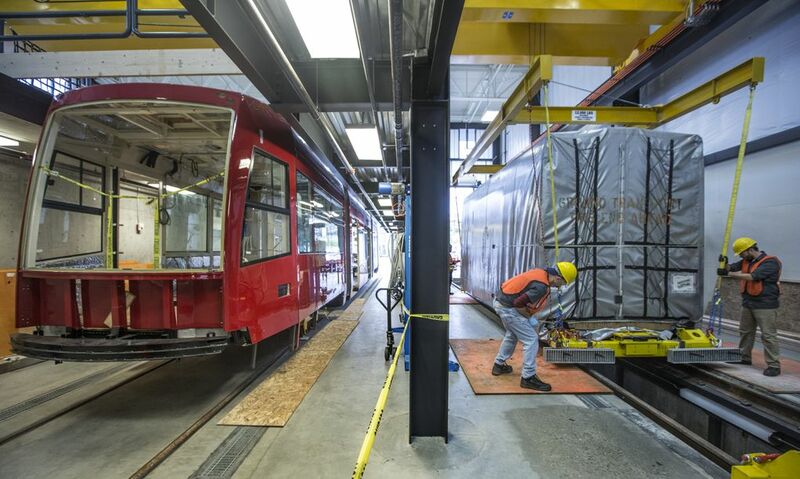 Currently, three trains are undergoing final assembly by Pacifica Marine at the city’s new streetcar base near the Chinatown International District but need parts or oversight from Inekon; three are still being manufactured in the Czech Republic; and one arrived this weekend from the Port of Tacoma after being delayed by the longshore labor dispute, the Capitol Hill Blog reported. Friday’s new change order would charge Inekon $500, $750 or $1,000 per day of delay per train, based on whether final testing and acceptance are done in early June, late June or in July — for a total $7,000 a day if the schedule badly blows out. And there’s an incentive, said Kubly. SDOT agreed to an 18-month option, stretching until late 2016, to buy Inekon trains for a proposed downtown link, at the current price of around $3.7 million per vehicle. And the city agreed to charge only $110,000 in damages already accrued for past schedule delays, while forgiving $150,000. “We wanted to make sure there was an incentive there to ramp up the workforce. It’s more important to get them to hit their current deadline, rather than worrying about a deadline that’s passed,” Kubly said. In the broader picture, other U.S. cities are planning new streetcar lines, but the network of streetcar planners and evangelists who buy trains is fairly small. In Oklahoma City, officials have favored Inekon but are nervously observing how the late deliveries play out in Seattle, The Daily Oklahoman reported. Seattle doesn’t have the money to build the third line through downtown. However, the city is applying for a Federal Transit Administration grant, under the same program that offered $75 million to Sound Transit three weeks ago to extend its Tacoma Link streetcar. Kubly said a similar award to Seattle would fund half a First Avenue line across downtown. Rasmussen expects to see another bill, to pay for consultants just hired to monitor assembly in Europe. “Will delays increase the costs to the city? That is what we need to find out,” he said.